22 year old Anita Gindha, was eight-and-a-half months into her pregnancy when she was strangled at her house in Manor Park, East London, on February 19th 2003. Anita had fled a projected arranged marriage to build her family on love with Kashmir Ralh. Two years later, when she was just weeks away from giving birth to her expected second child, she was strangled to death in front of her toddler son. Palwinder Dhillon, an elderly illegal immigrant living in Walsall, West Midlands who was a former employee of Mrs Gindha’s husband and also a friend of her family’s was accused of her murder. On the day of the killing, neighbours heard Anita’s screams and saw a man in an orange turban leaving the house. Her husband Kashmir Ralh found her when he returned from work with their 19-month-old son crying besides her. He thought, because she was pregnant, she had fainted. 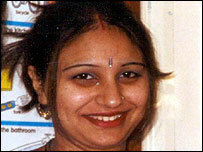 On 21/05/2004 Palwinder Singh Dillon was found guilty at the Central Criminal Court of murder. He was sentenced to life imprisonment with a minimum tariff of 16 years. ‘Nay but I heard her sing. In all its ebb and flow in your heart and veins. The way she lived it, a warrior for love. ;( … tears heartbreak 1st for the horror felt in Anita’s heart when she knew her unborn baby was being killed and she was helpless to protect her baby.. and then the atrocity of Anita knowing her toddler was watching the unspeakable.. and lastly for the pain of dying this violent death where it crushed all meaning of justice and sense of humanity and destruction of good and LoVE .. into the hands of evil brought by ‘family’ ..who wants to live on a planet where this kind of destruction by retarded sense of dishonor exists..
God stood angels ready to receive her & her baby with GLORY at her moment of horrific death * .. NEVER FORGET .. God bless her beloved husband and the image he will NEVER erase from his mind .. help us understand the man’s soul in orange turban and how his hands could impart this act ?? ?